You are here: Home › News › Treat (no trick!) for October. Something complimentary and valuable. Every now and then I do a survey. For example, five months ago we did a survey to find out what you thought about lesson planning. Two great things came from the survey. First, we learned a great deal from your thoughtful comments. We used your comments to put together something amazing for each of you. Therefore, the second goodie is that, although only one person (Ginna Myers) won the grand prize, everyone has won something of great value. In fact, it might be the single most important gift I could ever give you… and it’s FREE (free is good)! For years, I have pushed a more thoughtful approach to teaching that combines the power of emotions, movement, music and the development of cognitive capacity. But the challenge to use a more brain-based approach is in the proper planning, sequencing and execution of the processes. Why is this planning so important? If you’re doing the wrong thing in teaching, kids lose out and either they don’t change or they change for the worse. Kids can change more quickly than you ever thought. A recent study at the Max Planck Institute for Cognitive Thinking by Dr. Draganski and colleagues stated, “…we demonstrate significant gray matter volume increases in frontal and parietal brain areas following only two sessions of practice…” (Taubert, et al. 2010). This stunning discovery that our brain can actually change its shape within days or weeks in response to certain mental and physical stimuli is dramatically different from the “old school” fixed mindset that change happened after months or years (or, not at all.) We now know that just doing complex thinking can literally add gray mass to the brain (Aydin, K., et al. 2007). But how do we get kids to be doing the complex thinking required for high performance learning? As you know, there’s a process and sequence for developing competency as a teacher. At most skill levels, lesson planning helped teachers do better. The lesson planning forces the mind to develop mental milestones and signposts for key learning steps. We know that students do better with a blend of formative assessment and thoughtful, planned instruction (Crévola, et al., 2006). Some evidence suggests that lesson planning is powerful for differentiating with special needs students (Spooner, et al. (2007). We know that lesson planning can help teachers become more reflective in their thinking about teaching (Ho, 1993). Highly effective teachers (those whose kids averaged more than one (1) year of progress per calendar school year) typically internalized the teaching at such high levels that they needed less, not more planning (Borko, and Livingstone, 1990). It was only those at the highest level who did not use lesson planning. In short, teachers have to climb the “complexity ladder” for teacher training, first, in order to get so good that they eventually didn’t need planning. Music teachers, for example, needed less planning when they were at the top of their game (Brittin, 1995). Less experienced teachers actually needed more planning. So why does more expertise lead to less planning? It seems counterintuitive. Once a teacher internalizes all of the usual and known variables with the necessary sequences and steps, then and only then, can the highest level of teaching rise. I suspect that the highest performing teachers know the “basics” so well that their brain is only consciously processing all the freshest, fastest moving micro details that need quick responses. These experts are actually responding only to the immediate novelty of the day, and that’s less of a cognitive load. The result? They can allocate less brainpower to planning and more brainpower to the spontaneous things that can make for an amazing lesson! So, how can we get you to that high level? You can do it; you may just need a little help. When you follow the protocol for change in the human brain, it happens faster and more consistently. The powerful recent discovery that a brain can change fast and even can alter its shape and size during a very short time in response to relevant, practiced, experience-dependent activities gave me an idea. In order to get the kids to become better learners, we first have to develop this in our teacher’s brains. We’re not in the 20th century anymore. Teachers will need to be “literally” up to speed. Teachers today need to sort, analyze, process and sequence daily lessons faster and more thoughtfully than ever before. This process is learnable, doable and it’s important. The training to acquire this lesson-planning skill will induce experience-dependent structural plasticity in your (the teacher) brain. Let me repeat that: this process will lead to structural changes in your brain. You will be different; but, if you’re the same teacher this year as you were last year, your kids just lost out. You have to get better. In order for your students to get better, you’ll have to get better. This process is called brain-based, experience-dependent structural plasticity. It develops with relevant, long-term practice. You’re about to retrain your brain to think faster, and more thoughtfully. You’re about to learn how to analyze, sort and develop spectacular lesson plans in ten minutes or less. In short, things are about to get very, very good for your brain. I’ll tell you about your gift in a moment. But first, you’ll need some background. We all know there is increasing pressure on all teachers for accountability. We also know that there is evidence that lesson planning usually leads to better quality lessons. Our survey showed us that you would do more lesson planning, but it takes too much time. What if there was a way to do lesson planning much quicker without compromising quality? The solution is simple but profound. We have listened to your input and come up with a way to help you build a fresh, research-based lesson plan (as a teacher, principal or staff developer) in ten minutes or less. However, you are not likely to do it within this 10 minute time frame on your first try, any more than you would have gotten to the expert level on Donkey Kong, Pac-Man or Angry Birds on the first try. Your brain has to learn how to pay attention, process, strategize, and remember “on the fly” very quickly. That takes a little time. It’ll be the same thing with the Ten Minute Lesson Plan. At first, you’ll feel a bit rushed. No worries… I’ll let you edit your work and clean it up at the end. There’ll be a timer to pace you as you work through the screen prompts. 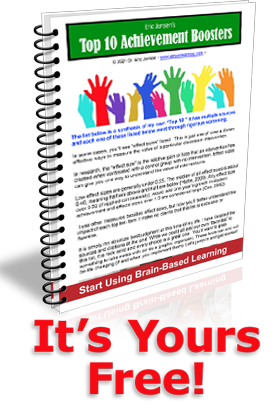 This is the first lesson planner that is scientifically designed to change your brain. The capacity of your brain to change (from repeated, relevant input) is called plasticity. You’ll learn to pay attention to more relevant factors in planning, you’ll learn how to focus, to get succinct, type fast and then, move on. Yes, it’s true; you can learn to develop amazing lessons in just ten minutes. But I have to admit one thing: though the site is up and running, it’s far from perfect. You’ll be the “beta testing” group. We need your feedback. If you love it, tell us. If there are gaping holes in the quality, we hope you will tell us that, too. My goal is to make this the most amazing lesson planning site ever. P.S. Did I already mention that it’s free? Hope you enjoy the gift! Borko, H., & Livingstone, C. (1990). Cognition and improvisation: Differences in mathematics instruction by expert and novice teachers. American Educational Research Journal, 26, 473–498. Brittin, R. (1995) Preservice and Experienced Teachers’ Lesson Plans for Beginning Instrumentalists. Journal of Research in Music Education Spring 2005 vol. 53 no. 1 26-39. Crévola, C. Hill, P., & Fullan, M. (2006) Critical learning instructional path: Assessment for learning in action. Orbit, 36(2), 10–14. Ho, B. (1993) Using lesson plans as a means of reflection. ELT J (1995) 49 (1): 66-71. Spooner, F., et al. (2007) Effects of Training in Universal Design for Learning on Lesson Plan Development. Remedial and Special Education March/April vol. 28 no. 2 108-116.